Nobody ever left Yampol. Citizens of the small town in Southwest Ukraine were born, lived, and died within its limits. They didn’t worry about exploration or education. They only left Yampol when the Nazis came. In a cart pulled by two horses, young Isyaslav Darakhovskiy and his Jewish family fled the invading Germans, leaving behind the only corner of the world they had ever known. They were soon imprisoned in a Nazi concentration camp. Even after their release, those who survived were branded, forced to state on all records that they had lived in German occupied territory. For ten bleak years, Isyaslav (called Izzy) led a life of fear and physical hardship. Despite academic excellence in high school, Izzy was shut out by colleges for five years. For a time he worked as an accountant in the Ukraine and as a farmer in Kazakhstan. Then he was drafted into the army, where he spent three years serving in the deserts and mountain foothills of Central Asia. At 25, he was discharged and finally received a University scholarship. With it came a new start. Izzy graduated with honors and soon after won an Economics professorship at the prestigious Academy of Sciences. But his trials were far from over. The government had begun to distrust scientists, and this, combined with prevalent anti-Semitism, made Darakhovskiy’s career a constant struggle. He was often watched by undercover KGB agents when his work took him outside the country or elsewhere within the USSR. After the break-up of the Soviet Union, Dr. Darakhovskiy quit his job and immigrated with his family to the United States. He left his property, social status, culture and friends and started life anew in an unfamiliar country where communication alone posed a frustrating challenge. His battle against the social, professional, and financial limitations of an older immigrant in America presented an intimidating challenge. 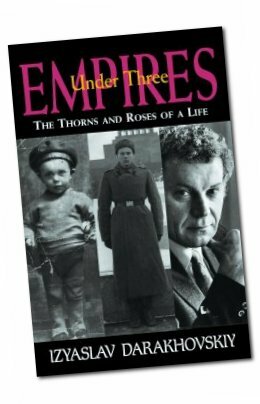 Under Three Empires is the tale of a man whose undaunted persistence enabled him to overcome adversity in three of the most powerful empires of the 20th century. No matter what (or where) the challenge, Darakhovskiy has never lacked the courage or resource to adapt to his perpetually uncertain future. His unlikely success is a testament not only to his character, but to an individual’s ability to triumph over a sometimes-oppressive world. To order through our website, press the “order now” button to proceed to our secure payment center. For faster service on charge orders, call us toll free at 1-800-953-9929.